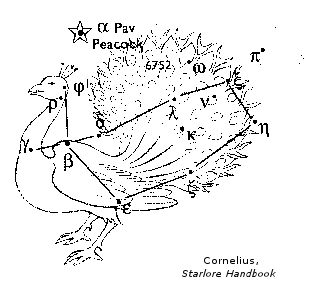 Alpha (α) Pavo, Peacock, is a star in the starry tail of the Peacock. Legend: It is said to represent Argos, the builder of the ship Argo, who was changed into a peacock by Juno when Argo Navis was placed in the heavens. [Robson*, p.55.] See Star Tales for the story. *[Fixed Stars and Constellations in Astrology, Vivian E. Robson, 1923].